Yahoo Parenting: Is a Mother’s Intuition Real? Intuition is another form of intelligence that comes from an instinctive feeling rather than intellectual reasoning. Scientists believe it operates through the right side of the brain and through our gut, producing that gut-feeling or hunch so many of us can recognize. Mothers are well versed in intuition and can often sense sickness in their children. Intuition can often help us heed warning signs of illness or threat before they occur. It can also be a powerful tool in guiding us through important decisions. For example, an intuitive “yes” to a problem can feel comfortable, energizing or flowing, whereas an intuitive “no” can feel heavy or like a knot in the stomach. 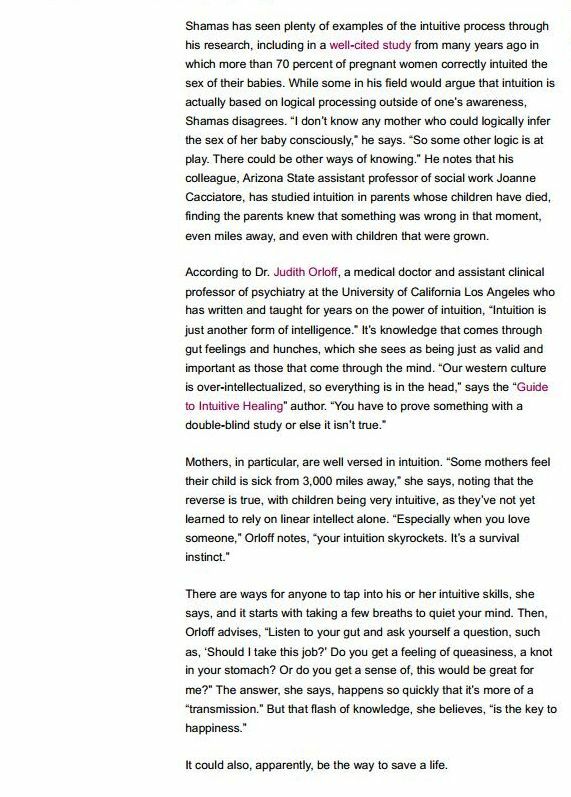 In Yahoo Parenting, I share the powerful effects of our intuition and how to tap into our intuitive skills for a lifetime of guidance. Read the full article on Yahoo Parenting here.